Strapped to a flying helicopter while plunging into a burst of explosions, diving into motor oil sludge, eating live scorpions and being chained in front of a cement truck while it’s ramming into obstacles are stunts usually designed, executed and supervised by trained professionals. 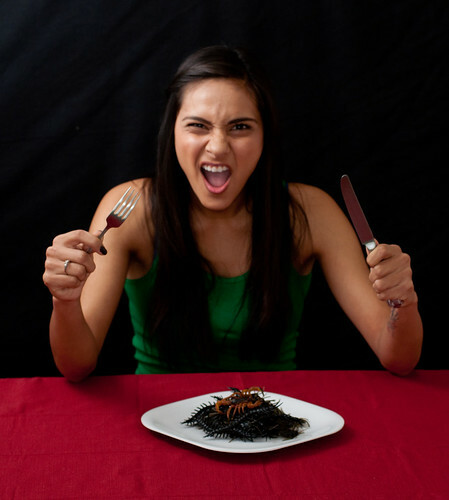 Amanda Gomez had to eat a scorpion as a challenge to win Fear Factor. She was afraid of bugs but overcame to come out winning the show. Photo by Nelson Estrada. They should not be attempted by just anyone, anywhere, anytime. But these were the challenges SF State microbiology major Amanda Gomez encountered on the path to winning the “Fear Factor” grand prize of $50,000 and proving that a woman of a thin build and bubbly personality can complete challenges of extreme danger. Her brother, Alex Gomez, 24, competed alongside her and initially didn’t take her seriously. In “Fear Factor,” four teams of two are presented with a series of challenges that include feats of strength, testing their physical endurance and gross stunts testing mental resolve, most of which include contestants facing their fears. If contestants complete their task, they advance. If fear stops them from completing a stunt or they fail the mission, they are immediately eliminated. The team that wins the final stunt is awarded a $50,000 grand prize. The original series was broadcasted from June 2001 until September 2006, when the show was cancelled by NBC due to poor ratings. The revived series of the show premiered Dec. 12, 2011, featuring the Gomez siblings. According to the office of Paul Telegdy, NBC president of alternative and late night programming, the television program was revived with a new format formula. Wanting to test out her luck, Gomez applied and got an immediate response. Matt Kunitz, executive producer of “Fear Factor,” said the Gomez’s stunts were larger and more spectacular than in the original series. The episode was filmed in September 2011 and was shot in various locations of the Los Angeles area such as the Long Beach docks and warehouses near NBC Universal Studios. Although Gomez said that the action sequences were intense the one challenge that frightened her the most was the devouring of live scorpions. Gomez is also a computer teacher at Daniel Webster Elementary School in the Potrero Hill District of San Francisco and according to Principal Moraima Machado, she is an inspiration for the students at the school. Despite showing that explosions and insects don’t frighten the microbiology major much, Gomez does have her own set of fears. Her greatest fear is not being successful at school. But with the show under her belt and $50,000 to invest in medical school after graduation, Gomez said she isn’t letting fear get in her way of success anymore.